In 1940, Ridgefield’s black community was large and active enough that members decided to establish their own church. They approached the Rev. 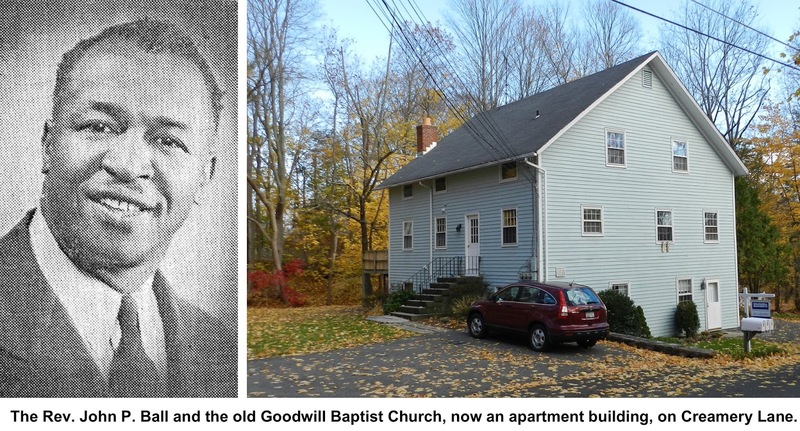 John Ball, who had recently become a pastor in Norwalk and, led by Ball, the Goodwill Community Baptist Church had its first service March 5, 1941, in the First Congregational Church chapel. A year later, the 34-member congregation bought the former creamery on Creamery Lane from Samuel S. Denton, and converted it to a house of worship under Ball’s leadership. Born in 1908 in Richmond, Va., John Percell Ball was the son of a Baptist minister who was pastor of the Goodwill Baptist Church in downtown Richmond — Ridgefield’s church was named after his father’s congregation. He graduated from Virginia Union University in Richmond and was ordained a Baptist minister in 1934. He came north in 1938, first serving as pastor of a Methodist congregation in New London and soon settling in Norwalk where he was pastor of Grace Baptist Church for 20 years and then founder of Canaan Institutional Baptist Church. The new church on Creamery Lane was officially dedicated in 1942, and chief speaker at the service was the Rev. W. B. Ball, the pastor’s father. Among the guests were the Rev. William Lusk of St. Stephen’s, the Rev. George Tompkins of Jesse Lee Methodist, and the Rev. Hugh Shields of the First Congregational as well as Selectman Harry E. Hull. Though he was primarily a pastor in Norwalk, where he lived, he participated over the years in many Ridgefield community events and was well known and liked here. At the town’s memorial service for President Franklin D. Roosevelt in 1945 in the high school auditorium (what’s now the Ridgefield Playhouse), he was one of two soloists to sing — the other was Metropolitan Opera star Geraldine Farrar. In Norwalk, he was much more active, serving on the Norwalk Common Council and as head of the NAACP. He was instrumental in getting Norwalk to hire its first black teacher, and was also behind efforts to hire the first black firefighter and policeman. He helped pass the city’s Fair Housing Law and was involved in creating the Fair Rent Commission. He co-founded NEON, Norwalk’s anti-poverty agency, and worked to help the homeless. Over the years, he lobbied for civil rights not only in Norwalk, but also in Hartford and Washington. Ball served the Goodwill congregation until 1959, and returned in 1969. However, dwindling membership led to the closing of the Goodwill church by 1975. The building is now an apartment house. Ball died in 1992 at the age of 83, leaving “his mark upon Norwalk as a mighty warrior and an ambassador for the cause of Christ,” his Canaan congregation said. For years it was thought that the Goodwill building had been moved to the site from the old Village Green, where it had served as the First Congregational Church from around 1800 to 1888. However, Robert J. Walker, who bought the building in 1976 and converted it to apartments, believed this to be impossible. In renovating the structure extensively, he found that the first floor, rotted and termite-infested, was the only portion of the three-story building that could have been the old creamery. His study of the framing – it was actually two buildings joined together – indicated that the structure was not large enough to have been the old Congregational church, photographs of which he had examined. However, pieces from the old church, such as beams, may have been used in constructing the creamery.